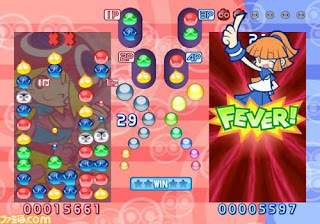 I've always liked Sega's Puyo Puyo series. Simple, addictive puzzlers with tight controls and slick graphics--what more can you ask for? Well, Wii owners who feel the same way should be happy to hear Sega's bringing the series to Nintendo's newest system sometime in the near future. Not much more is known about the game as of yet, though the always wonderful Famitsu has updated its website with a few shimmering shots of the title.